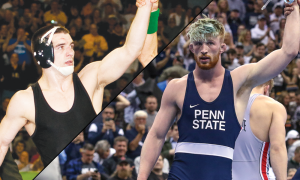 For the first time since 2015, three freshmen advanced to the NCAA finals and if this year’s group turns out to be as strong as Kyle Snyder (Ohio State), Isaiah Martinez (Illinois), Nathan Tomasello (Ohio State), and Zeke Moisey (West Virginia), college wrestling’s future is in good hands. Plenty of those who did not reach the title bout made an impact across the country and made some of the decisions in assembling this year’s TOM All-Freshman Team extremely difficult. In the end, we narrowed the freshman class, excluding redshirts, down to 30 deserving grapplers, three full teams. Congratulations to all! Tom Brands doesn’t like to wrestle true freshmen and Lee was coming off surgery to repair an ACL tear, spending most of the year in a bulky knee brace. When Spencer fell to Ronnie Bresser (Oregon State) in a controversial match at the Midlands, some wondered if he would be better off waiting until 2018-19 to pursue an NCAA title. Instead, Lee was freed for Iowa’s January 5th dual against Michigan State, then lost just once the rest of the way, a 2-1 defeat in the Big Ten finals to Nathan Tomasello (Ohio State). Sandwiched around that loss were a pair of wins over the Buckeye, including a pin in the national semifinals. After he controlled Nick Suriano (Rutgers), 5-1, the Hawkeye became the first true freshman to win the 125-pound class since it returned in 1999. Lee was also the first Iowa true freshman to win a national title since Lincoln McIlravy in 1993. Spencer finished 22-2 on the season. When the light comes on for young wrestlers, it can be exhilarating to watch. 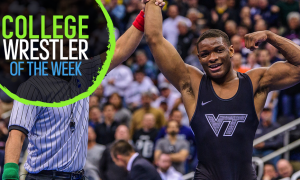 Few wrestlers have exemplified that as well as Wilson who began the season battling for a lineup spot, lost twice at the ACC tournament, then made just about everyone in Quicken Loans Arena a fan of his during an electrifying run to third-place. Tariq’s length and aggressiveness made him incredibly fun to watch as he scored at least seven points in every bout, including his only loss which came at the hands of eventual champion Seth Gross (South Dakota State) and was 10-10 at the end of regulation. Kaid Brock (Oklahoma State) hammered Wilson in January, 16-1. In Cleveland, the Wolfpack redshirt freshman had all the answers, avenging the loss 13-5. In all, Tariq took down the third, fourth, and fifth-seeded wrestlers during his run, majoring two of them and beating the other 8-3. He wraps up the season with a 27-10 record. What can you say about the true freshman from Cornell? He lost just once during the regular season when Jaydin Eierman (Missouri) cradled him late while Diakomihalis was leading. During his run to a national title, the first for a Big Red freshman since Kyle Dake, Yianni had to come from behind against two-time NCAA champion Dean Heil (Oklahoma State) in the quarters, avenge his loss to Eierman in sudden victory, then find late points to dig out of another hole in a 7-4 victory over Bryce Meredith (Wyoming) in the finals. If that weren’t enough, after the tournament we learned Yianni had torn his ACL during his scrap with Heil, but rallied to win, then took two straight against elite competition despite the injury. With Cornell finishing seventh with one of the best performances compared to seed in this year’s tournament, having no senior starters, and bringing in even more talent next year, Diakomihalis will need to get his rehab taken care of so he can return to what should be a strong team in 2018-19. After entering the NCAA tournament as the seven seed, Deakin fell 4-3 to Jason Tsirtsis (Arizona State), a past NCAA champion who would earn his third All-American honor, in the second round. The redshirt freshman’s run on the back was cut short when he ran into second-seed Brandon Sorensen (Iowa), himself rallying after an upset, in the round of 16. Though it did not end as he had hoped, Deakin had a stellar year. Ryan went 32-7 with a previous win over Tsirtsis and 10 other wins over NCAA qualifiers. The Wildcat did not suffer a single loss to a wrestler who had not already been an All-American and only Justin Oliver (Central Michigan) beat him in 2017-18 but did not stand on the podium in Cleveland. Of those who beat Deakin, only Oliver and Matt Kolodzik (Princeton) return. Expect to see Deakin battling for a high finish in 2019. Hidlay’s redshirt freshman season was nearly perfect. After finishing the regular season 20-0, including wins over Micah Jordan (Ohio State), Mitch Finesilver (Duke), and Joey Lavallee (Missouri), Hayden won the ACC title, though he was pushed by Finesilver and Taleb Rahmani (Pitt). With Lavallee, Jason Nolf (Penn State), and Michael Kemerer (Iowa) all drawn into the bottom side of the bracket in Cleveland with Hidlay earning the top line, the Wolfpack 157 had a great chance to reach the finals. He took advantage, doing what he had done all year long, staying in great position, waiting patiently for his opportunity, then striking when he saw an opening. He opened with a major decision, survived close matches against Rahmani and Tyler Berger (Nebraska), then blew open his semifinal showdown with Alec Pantaleo (Michigan) en route to a 10-2 victory. Though Nolf would end the freshman’s quest for a perfect season in the finals, 6-2, Hidlay became the first NC State freshman to reach the title match since Matt Reiss in 1980 and combined with teammate Michael Macchiavello (197) to give the Wolfpack two finalists for the first time in program history. When the NCAA tournament brackets came out, everyone immediately circled Wick’s potential second-round clash with Logan Massa (Michigan) as one to watch. The two had already met three times with Massa taking the first bout back in November, Wick evening the score a month later, then extending his advantage to 2-1 with a one-point win in the Big Ten tournament, where he finished fourth. Even owning the series edge, many wondered whether Wick could hold of Massa in Cleveland. Not only did the redshirt freshman beat the 2017 third-place finisher for the third time, the 10-seed would roll up five wins over other seeded athletes in all, losing just once on his way to a third-place finish. Wick wasn’t just winning, either. He pinned 12-seed Nick Wanzek (Minnesota) in the round of 12, majored five-seed Alex Marinelli (Iowa) in the consolation semifinals, and pinned Chance Marsteller (Lock Haven) in the bronze medal match. Evan finished the season 29-7 and sent head coach Barry Davis out a winner. Just three freshmen qualified for the NCAA tournament at 174 pounds this season and they were all from the ACC. Bolen was the conference runner-up behind Ethan Ramos (North Carolina) after beating one of the other freshmen, Daniel Bullard (NC State), in the semifinals. In all, Bolen notched six wins over other NCAA qualifiers including a 14-6 major decision over Ramos back in February. The true freshman from Christiansburg, VA, stepped right into the lineup for the Hokies and went 21-12 overall. With All-Americans to either side of him and outstanding redshirt Mekhi Lewis ready to contribute next season, we could see Bolen get his chance to sit. Whether he redshirts or is back in the lineup, look for Hunter to continue working towards the podium after a solid start. When he notched three falls and a 17-1 tech on the opening weekend of the season, Venz earned wrestler of the week honors and declared his intent to be a factor at 184 this season. Though, oddly, he didn’t secure another pin after getting his seventh in Vegas, he never stopped winning. Taylor was fourth in the Big Ten tournament behind three of the top-five wrestlers in the country, including the top two. He headed to Cleveland as the seven seed and despite a second-round upset at the hands of Chip Ness (North Carolina), the Cornhusker worked his way to the round of 12. There he faced four-seed Pete Renda (NC State), a past All-American who had beaten Venz, 9-6, in mid-December. This clash would go very differently as the redshirt freshman rolled to an 11-3 major decision to secure his spot on the podium. He wasn’t done, though, as Taylor would win his next two matches, over nine-seed Max Dean (Cornell) and six-seed Zack Zavatsky (Virginia Tech), ultimately finishing fourth, the same position he found himself in at the Big Ten tournament. In all, Venz went 29-9 with 19 of those wins including bonus points. During a season in which 197 pounds was a madhouse across most of the country, Darmstadt was the picture of consistency until the very end. After a January 12th loss to Frank Mattiace (Penn), Ben would win 30 matches in a row, pushing the two seed into the NCAA semifinals and ensuring at least a sixth-place finish. During that run, the Big Red freshman would pin 16 opponents and avenge his only loss of the season twice. Unfortunately for Cornell, when Jared Haught (Virginia Tech) ended Darmstadt’s winning streak, it started the young man from Elyria, Ohio on a losing streak as he fell in his next two matches as well, against Kollin Moore (Ohio State) and Jacob Holschlag (Northern Iowa). Even with that rough ending, Ben finished 33-4, won his first EIWA crown, and became an All-American. He will be a key part, along with Diakomihalis, as Rob Koll looks to put his team back in the hunt for a team trophy. Often overshadowed during this era of fantastic heavyweights, the Cadet world silver medalist and Junior world team member finally got his crack at NCAA competition after an apprentice year behind Doug Vollaro. All season, he was rock solid, taking care of business against those he was expected to beat and only losing to top-10 opponents. When he beat Ryan Solomon (Pitt) in the final dual of the regular season, then upended Mike Hughes (Hofstra) to win an EIWA title, it seemed as if Jordan was peaking at the right time. He headed to Cleveland as the number 10 seed and pushed seven-seed Nathan Butler (Stanford) into sudden victory before falling into the consolations. Two wins there put the Mountain Hawk into the round of 12, needing one more win to become an All-American. Facing Youssif Hemida (Maryland), the 12-seed, Wood suffered a first-period injury and was forced to default. He wraps up the year with a 22-7 record and should be squarely in the All-American conversation heading into 2018-19.